Live From Australia: Vineyard Music EXTRA! Im sorry. Im a big time Vineyard fan. In fact I have every Fathers Heart (the full albums, not the compilations) and Winds of Worship there is on CD. This album is so bad that it has been collecting dust in my CD rack for months. The only songs I ever blow the dust off to listen to are Brents and Andys. Rae-Hellen Fisender sounds like she has a great heart for worship, you can tell from the recording. But her version of Andys Blessed Be The Name was awful. Her voice is not pleasing to listen to. 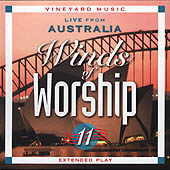 I guess it seemed just a little strange to me that around the time that music from Hillsong was in its hype, Vineyard Music Group happened to release this album, from Australia with a dominant female worship leader. A coincidence? I dont think so. VMG does not need to compete with the market of music coming out of Australia. Im sure there were a few people suckered into purchasing this album, thinking that it was from Hillsong. If that is what VMG wanted to accomplish then well done. But Im not looking forward to future albums from Australia unless Rae-Hellen stays in the background. No offense, but Rae-Hellens voice and worship leading does not come close to Darlene Zschechs of Hillsong. It was a mistake to give a new comer 7 of 10 songs on a popular series like Winds of Worship, while two veterans split 3 songs between them. When I bought the album I thought I would be hearing two of my favorite worship leaders, Andy and Brent. They were both listed before Rae-Hellen. But instead I got 2 songs with Brent (Exalt the Lord would be great without the didjeridu! AHHH!) and one song with Andy. Rae-Hellen dominated the recording which proves my point that VMG was trying to put out something of their own to compete with Hillsong. If you do not collect the Winds of Worship series, skip this one. Not only are the majority of the songs bad, but the sound of the recording is sub-par.